Norma offers over 20 years of direct leadership experience with a passion for building strong communities. 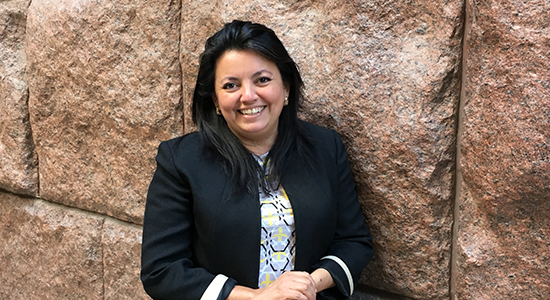 As a Senior Program Officer for the National Main Street Center, Norma works in the field with state partners and hundreds of communities across the country. As the Director of Leadership Development, she helped define the framework for Main Street America Institute, the Center’s new professional development program and conducts regular leadership trainings at state-wide and national conferences. Prior to joining the Center, Norma provided direct Main Street leadership and nonprofit management and continues to support the crucial role of local leaders in successful revitalization.Born in Latin America, Norma utilized her strong multicultural background to build a very diverse downtown revitalization program in Elgin, IL and later created the Center’s Diversity Services to promote initiatives that lead to inclusive engagement. Raised in a family of entrepreneurs and community leaders, Norma understands the needs of small businesses and the impact of stakeholder involvement in community efforts.Her previous work in heritage tourism to the Meso-American regions offers insightful tools that assist in promoting community assets and building unique destinations. When a hurricane hit her home country, Norma led immediate relief efforts and then worked to implement strategies to improve physical conditions and re-energize local economies through public & private partnerships. Norma received her education in Civil Engineering and uses her training to promote physical improvements that value authentic character and enhance strong sense of place. The depth of her active leadership and experience provides a strong foundation for Norma’s passion and work with communities of all sizes. Norma has presented on the Main Street Approach™ to communities implementing revitalization in Taiwan and provided trainings for organizations and governments in Panama and Mexico. Most recently, Norma has been instrumental in implementing the refreshed Main Street Approach across the US. She led the first state-wide implementation initiative through a strong partnership with Michigan Main Street. She is currently working with additional states sharing the complete process and conducting trainings to help local leaders identify, develop and implement the Transformation Strategies that are integral to the refresh process.